Formal dining rooms are often the least used space in a home. Our desire was to take a small, non-descript room and turn it into a space that reflects the owner's love of art - to make this a place where guests would naturally gravitate to the art collection. The challenges were the small size of the room (11 x 14) and the lack of visual interest. The only interesting architectural feature was the chair rail. 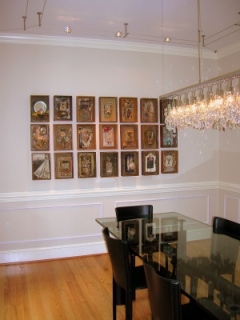 We added custom wainscoting moldings to balance the art on the walls above. 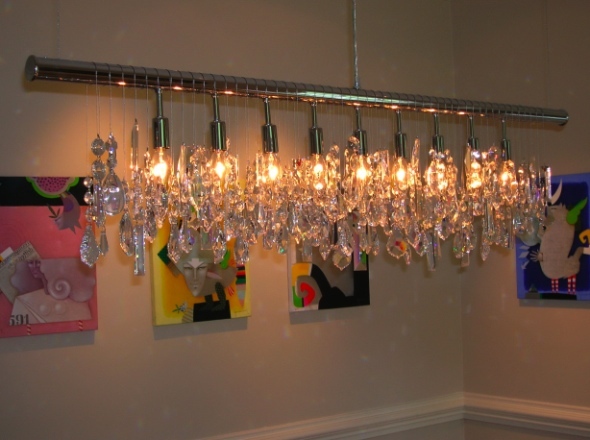 The original light fixture was a standard builder's grade chandelier. 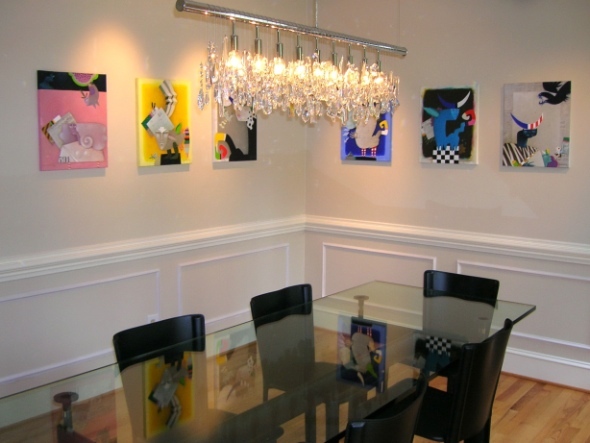 We replaced that with an artsy crystal piece that reflects sparkling light patterns on the walls, which is a nice foil for the simple, unframed canvases. Provisions for lighting art were not originally wired into the room. We added a low voltage cable system to spotlight the art. The result is a completely original space, filled with vibrant color and light, which expresses the personality of its world-traveled owner.